In previous years, I always used to go to a colorist to get that gray banished from my hair. Since having children and lack of time, I tend to DIM (do it myself), so it’s been a while and I’m a little out of the loop on professional color. Redken is best known for its innovative haircare and styling products. What you may not know is that nearly 50% of Redkenâ€™s business results from professional haircolor. With this high demand for Redken professional haircolor, there is a huge opportunity to understand the benefits of professional haircolor. Whether you’re looking for a fashionable new look or want to take a few years off by blending away gray, Redken haircolor products, along with your colorist’s expertise, will get you the results you desire and will develop your custom color formulation following your color consultation. Redken haircolor options include the latest fashion trends â€“ from deep brunettes and fiery reds to cool blondes. If you’re gravitating toward a highly stylized look, consult with your colorist to see how to best adapt the fantasy of the runway to your individual needs. Or you may choose to add depth and dimension to your natural haircolor with highlights or lowlights. Redken haircolor is divided into three categories â€“ demi-permanent haircolor, permanent haircolor, and lighteners. Demi-permanent haircolor falls between permanent and semi-permanent haircolor, and lasts between 4 to 8 weeks, depending on how frequently you wash your hair. This year, Redken celebrates 20 amazing years of haircolor with Shades EQ, originally introduced as the haircolor that thinks itâ€™s a conditioner. As the #1 long-lasting, no-lift, non-ammonia, demi-permanent haircolor in the U.S., Shades EQ has won BehingTheChair.com’s Stylist Choice Award for the past seven years, and is one of the most versatile haircolor brands colorists can use â€“ it provides healthy, shiny results, incredible conditioning with an amazing number of mixing possibilities. Shades EQ is used as a glaze, color refresher, and also color correction. Ingredients include acidic pH; no lift, non-ammonia formula; long-lasting colorants; wheat amino acids; and silicone. Redken For Menâ€™s Color Camo 10-Minute Camouflage Color is a better way to fight gray, in just 10 minutes. The non-ammonia formula takes gray “undercover” as much or as little as he likes, brings out “pepper” in salt and pepper hair, ensures natural-looking, low-maintenance results and rejuvenates hair with more strength and shine. Applied at the shampoo bowl, it’s a quick, discreet service, providing natural-looking results. Permanent haircolor typically lasts 3-4 months and uses dye molecules that interact with your hair’s natural pigment to create a final haircolor. Permanent color won’t rinse or wash out. Shimmer One, Redken’s ammonia-free one level lift permanent color cream gives you luminous color results in just 20 minutes. Exclusive Tri-Light Technology delivers soft, radiant haircolor in 26 shades (plus clear), locks in moisture and protection, and infuses hair with a shine so strong, it shimmers. Color Fusion is a modern, permanent color cream that delivers healthy-looking, multi-dimensional haircolor. With over 100 shades in six categories, it can be used to lighten, darken, match natural haircolor, cover gray or to create high fashion techniques. Redken’s specialized Colorbond Technology heightens its signature multi-dimensional color with optimum durability, condition, and shine. Ingredients include high tenacity dyes, ceramide, cationic conditioners, and coconut oil. Color Gels is a reliable and dynamic haircolor brand for any shade of pigmented hair and is used to brighten, darken, change or correct, or for highlighting and creative color effects. Color Gels provides exceptional gray coverage, from a few strands to high percentages of gray. Ingredients include Redkenâ€™s Select Dye System containing 100% oxidative, UV-stable, long-lasting dyes for holding power and resistance to fading. Lightening (also called bleaching or decolorizing) is the process of lightening hair â€“ creating just a few highlights, lightening selected sections of the hair, or applying to the whole head. Whether you want to illuminate just a few strands, or go from brunette to blonde, lightening requires expertise and the right products. Experience a luxurious salon lightening treatment. The lush cream formula intensely silkens, luminizes and lifts hair to the palest shades of blonde. Ingredients include Exclusive Lumisilk Technology, Ceramide, and Cire-Gloss combined with White Beezwax and a palm oil derivative to seal in moisture, leaving hair luminous and radiant. I hope this breakdown in color was helpful. 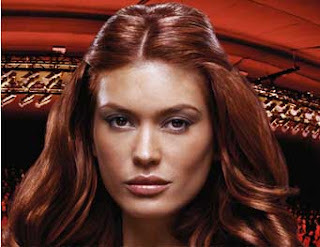 To locate a Redken Certified Haircolorist in your area, visit www.redkencolor.com. A Girl’s Gotta Spa! Hair Makeover for Fall at Salon A.K.S.